RRR Imaging Advertising Overview: Equine and HOA Web design, equine photography and graphic arts. We offer excellence in • Ad design and layout • Post card design • Business card design • Logo design • Digital photography • Digital photo retouching • Digital photography • Website design and hosting • and much more. Equine design is a passion of ours and it shows in our work. We enjoy making beautiful horses look even better and we are constantly learning in order to keep up with the newest technology available to create amazing graphic designs. 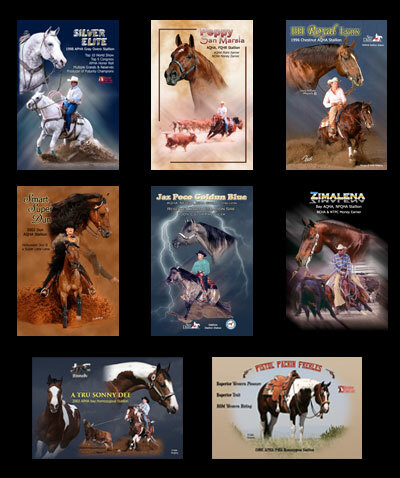 Our design work has been published in • The Equine Journal • Paint Horse Journal • Quarter Horse Journal • the Working Horse • NFQHA Journal • Today’s Horse Trader • the Wrangler • Ag Journal • Horse Connection • and many more publications including some front and back covers. Thank you for your interest; take a look at the equine ad design gallery for examples of our work.